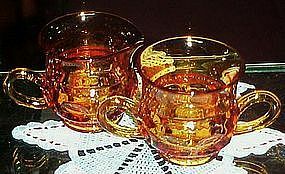 This is a pretty amber / gold Kings Crown Creamer and Sugar Set made by Tiffin or Indiana Glass. Most likely Tiffin because it has the elongated thumbprints. The Creamer and Sugar each measure 3" high and have low handles. They are both in excellent condition with no chips, cracks, or scratches. Be sure to search our other Kings crown glass available.